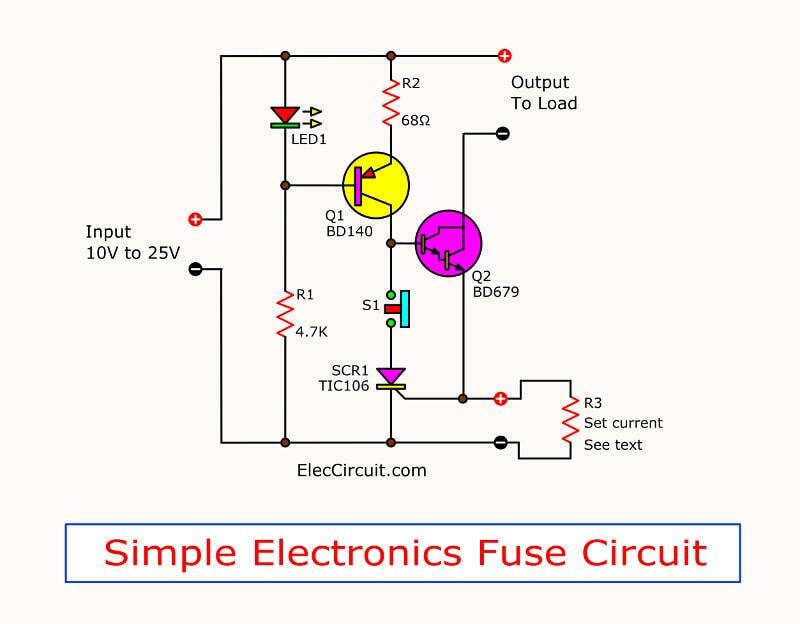 This is simple electronic fuse circuit. It can be used to replace conventional fuses. Because it’s comfortable not need to replace the fuse every time the power too over. 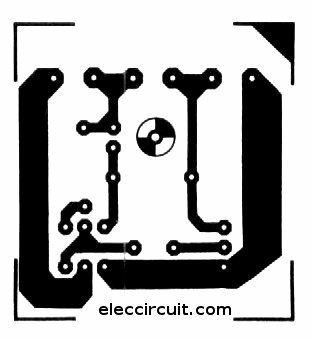 This circuit use transistors so simple and low cost. The Fuse is a type of electrical equipment to the poor. Because it sacrifices itself. To protect the safety devices in the circuit. In the case of current flow in circuit too much. Until it melted. Due to an error in the circuit. Fuse sold in the market. Can be used once. The structure is a glass cylinder with an alloy of lead wire is connected between the two terminals.When the current through it too much, Alloy within is temperature rises until the melting.Makes wires were cut off. In some experiments a electronic circuits require a fuse protection. Circuit may be difficult. Because, often short, to change the fuse every time. , Thus wasting time. To solve this problem, we Build this Simple electronic fuse circuit, so instead of plain fuses. By it can cut off the current immediately. When a short circuit as well. But can work immediately. Just press the reset button only. Convenient and economical than using plain fuses. We also can set up and cut off current as you want. How the electronic fuse works? The electronic fuse that we use in this project is in Figure 1. Which will include important devices are transistors of 2 pcs, and Electronic devices in thyristors type of 1 piece works, together. In the Figure 1, This project across between the power supply and load that will be applied immediately, When a input of electronic fuse to the power supply. Then, Q1-transistor conduct current causes a Q2-Darlington transistor works as well, collector and emitter will conduct current by resistor R3 out to the Load that connected with the pin output(K2). When the load use current will cause has a voltage across R3. If load use high current will cause voltage across R3 too much as well. As Ohm’s law. And When Load use current until voltage across R3 more than 0.6 volts. Then, this voltage will trigger to SCR1 conduct current. This SCR or silicon controlled rectifier will works or conduct when get trigger at pin gate (G), and It will bring current indefinitely. How to stop the Works is remove its power supply there. We will bring this feature to use in our circuit. When voltage across R3 over 0.6 volts, the SCR1 will conduct , makes voltage at base of Q2 drop to level that transistor can not conduct high current. From the original. collector and emitter has conduct current into stop, causes current flow to load next step, until push reset switch-S1 ,to separate SCR1 out of circuit. After that Q2 will start conduct current again. In the section of Q1, LED1 and R2 there, will be together serving as a constant current circuit. To Q2 conduct when Normal conditions, and stop current to Q2, when SCR1 conduct current to ground. The current of fuse that you want to cut off circuits, can easily set easily from changing R3 which is a current detector. When we use Ohm’s law, which circuit will cut current when voltage drop across R3 is 0.6 volts. Based this condition, we can find the right resistor with the following formula. Will have P = 0.6×0.5. So must select the Resistor of 1.2 ohms , the power rate is 0.3 watts But resistor size 0.3 watts no selling, so use 0.5 watts instead. From example can easily define current of electronic fuse. Who Those who want to use fust in others currents,can It can be calculated from equation (1) and (2) to calculate Resistance (R3). But should be less than 1 Amperes, because that Darlington transistor unbearable. And should be used only in the voltage of 10-25 volts. This project, with a small number of devices are easily constructed. Start from build PCB lay by size in figure 2. And place the device in the form in figure 3. It needs to be careful because the transistor leg and SCR similar shape. LED1 (Light emitting Diode) Red 5 mm. S1 Switch, press the off, released stick.